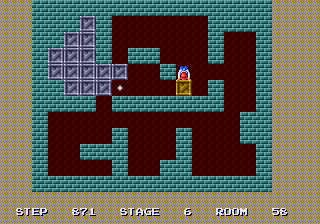 Room fifty-eight is with fifteen boxes for placement on the upper-left corner. Go LEFT, LEFT, LEFT, UP, UP, UP, RIGHT, RIGHT and push RIGHT. Go UP, UP, UP, RIGHT, RIGHT, RIGHT, DOWN, RIGHT, RIGHT, RIGHT and push UP. Go RIGHT, RIGHT, RIGHT, DOWN, DOWN, LEFT, push UP and UP. Go DOWN, DOWN, DOWN, LEFT, LEFT, DOWN, DOWN, DOWN, RIGHT, RIGHT, push UP, UP, UP and UP. Go RIGHT, UP, UP, LEFT, LEFT, LEFT, DOWN, LEFT, LEFT, LEFT, UP, LEFT, LEFT, DOWN, LEFT, DOWN, DOWN, push RIGHT, RIGHT, RIGHT, RIGHT, RIGHT and RIGHT. Go LEFT, LEFT, LEFT, LEFT, LEFT, LEFT, UP, UP, UP, RIGHT, RIGHT, RIGHT, DOWN, push LEFT and LEFT. Go RIGHT, RIGHT, RIGHT, RIGHT, RIGHT, UP, RIGHT, RIGHT, RIGHT, DOWN, DOWN, LEFT, DOWN, DOWN, DOWN, DOWN, LEFT, LEFT, UP, UP, UP, LEFT, LEFT, LEFT, LEFT, LEFT, LEFT, UP, push UP, go RIGHT, UP, push LEFT, go DOWN, LEFT, push UP, UP and UP. Go DOWN, DOWN, RIGHT, RIGHT, UP, UP, UP, RIGHT, RIGHT, DOWN, push LEFT, go UP, LEFT, push DOWN, DOWN, DOWN, go RIGHT, DOWN and push LEFT. Go RIGHT, RIGHT, RIGHT, RIGHT, RIGHT, UP, RIGHT, RIGHT, RIGHT, DOWN, DOWN, LEFT, DOWN, DOWN, DOWN, DOWN, LEFT, LEFT, UP, UP, UP, LEFT, LEFT, LEFT, LEFT, LEFT, LEFT, UP, push UP, go RIGHT, UP, push LEFT, LEFT, go DOWN, LEFT, push UP and UP. Go DOWN, RIGHT, RIGHT, RIGHT, UP, UP, UP, RIGHT, RIGHT, RIGHT, RIGHT, RIGHT, DOWN, push LEFT, LEFT, LEFT, LEFT, go UP, LEFT, push DOWN, DOWN, DOWN, go RIGHT, DOWN and push LEFT. Go RIGHT, RIGHT, RIGHT, RIGHT, RIGHT, UP, RIGHT, RIGHT, RIGHT, DOWN, DOWN, LEFT, DOWN, DOWN, DOWN, DOWN, LEFT, LEFT, UP, UP, UP, LEFT, LEFT, LEFT, LEFT, LEFT, LEFT, UP, push UP, go RIGHT, UP, push LEFT, go DOWN, LEFT, push UP and UP. Go DOWN, RIGHT, RIGHT, UP, UP, RIGHT, RIGHT, RIGHT, RIGHT, RIGHT and push DOWN, Go UP, LEFT, LEFT, DOWN and push RIGHT. Go LEFT, UP, LEFT, LEFT, LEFT, DOWN, DOWN, DOWN, RIGHT, RIGHT, RIGHT, RIGHT, push UP, UP, go LEFT, UP, UP, RIGHT, RIGHT, DOWN, push LEFT, LEFT, LEFT, LEFT, go UP, LEFT, push DOWN and DOWN. Go UP, RIGHT, RIGHT, RIGHT, DOWN, RIGHT, DOWN, DOWN, LEFT, LEFT, UP, LEFT, push LEFT, LEFT, LEFT, go DOWN, LEFT, push UP, go RIGHT, UP and push LEFT. Go RIGHT, DOWN, DOWN, RIGHT, DOWN, DOWN, RIGHT, RIGHT, RIGHT, RIGHT, RIGHT, RIGHT, DOWN, DOWN, DOWN, RIGHT, RIGHT, UP, UP, UP, UP, RIGHT, UP, UP, LEFT, LEFT and push LEFT. Go DOWN, LEFT, LEFT, LEFT, UP, LEFT, LEFT, UP, UP, RIGHT, RIGHT, RIGHT, RIGHT, DOWN, push DOWN, go RIGHT, DOWN, push LEFT, LEFT, LEFT, LEFT and LEFT. Go RIGHT, RIGHT, RIGHT, RIGHT, RIGHT, UP, RIGHT, RIGHT, RIGHT, DOWN, DOWN, LEFT, DOWN, DOWN, DOWN, DOWN, LEFT, LEFT, UP, UP, UP, LEFT, LEFT, LEFT, LEFT, LEFT, LEFT, UP, push UP, go RIGHT, UP, push LEFT, go DOWN, LEFT and push UP. Go RIGHT, RIGHT, UP, UP, RIGHT, RIGHT, RIGHT, RIGHT, RIGHT and push DOWN. Go LEFT, DOWN, DOWN, LEFT, LEFT, LEFT, LEFT, LEFT, DOWN, DOWN, RIGHT, RIGHT, RIGHT, RIGHT, RIGHT, RIGHT, DOWN, DOWN, DOWN, RIGHT, RIGHT, UP, UP, UP, UP, RIGHT, UP, UP, LEFT, LEFT, push LEFT, go DOWN, LEFT, push UP, UP, go RIGHT, UP, push LEFT, LEFT, LEFT, LEFT, go UP, LEFT, push DOWN and DOWN. Go UP, RIGHT, RIGHT, RIGHT, DOWN, RIGHT, DOWN, DOWN, LEFT, LEFT, UP, LEFT, push LEFT, LEFT, LEFT, go DOWN, LEFT and push UP. Go RIGHT, RIGHT, RIGHT, RIGHT, RIGHT, DOWN, RIGHT, RIGHT, RIGHT, UP, RIGHT, RIGHT, RIGHT, UP, UP, LEFT, push DOWN, go RIGHT, DOWN, push LEFT, LEFT, LEFT, go DOWN, LEFT, push UP, UP, go RIGHT, UP, push LEFT, LEFT, LEFT, LEFT, go UP, LEFT, push DOWN, DOWN, go UP, RIGHT, RIGHT, RIGHT, DOWN, RIGHT, DOWN, DOWN, LEFT, LEFT, UP, LEFT, push LEFT, LEFT, LEFT and LEFT. Go RIGHT, RIGHT, RIGHT, RIGHT, RIGHT, DOWN, RIGHT, RIGHT, RIGHT, UP, RIGHT, RIGHT, RIGHT, DOWN, DOWN, LEFT, push UP, go RIGHT, UP, push LEFT, LEFT, LEFT, go DOWN, LEFT, push UP, UP, go RIGHT, UP, push LEFT, LEFT, LEFT, LEFT, go UP, LEFT, push DOWN, DOWN, go UP, RIGHT, RIGHT, RIGHT, DOWN, RIGHT, DOWN, DOWN, LEFT, LEFT, UP, LEFT, push LEFT, LEFT and LEFT. Go RIGHT, RIGHT, RIGHT, RIGHT, DOWN, RIGHT, RIGHT, RIGHT, UP, RIGHT, RIGHT, DOWN, DOWN, DOWN, DOWN, DOWN, DOWN, LEFT, LEFT, UP, push RIGHT, go DOWN, RIGHT, push UP, UP, UP, UP, UP, go RIGHT, UP, push LEFT, LEFT, LEFT, go DOWN, LEFT, push UP, UP, go RIGHT, UP, push LEFT, LEFT, LEFT, LEFT, go UP, LEFT, push DOWN and DOWN. Go UP, RIGHT, RIGHT, RIGHT, DOWN, RIGHT, DOWN, DOWN, LEFT, LEFT, UP, LEFT, push LEFT and LEFT. Go RIGHT, RIGHT, RIGHT, DOWN, RIGHT, RIGHT, RIGHT, UP, RIGHT, RIGHT, DOWN, DOWN, DOWN, DOWN, DOWN, LEFT, LEFT, UP, UP and push RIGHT. Go LEFT, DOWN, DOWN, RIGHT and push UP. Go RIGHT, push UP, UP, UP, go RIGHT, UP, push LEFT, LEFT, LEFT, go UP, LEFT, push DOWN, go RIGHT, DOWN, push LEFT, LEFT, LEFT, LEFT, LEFT, LEFT and LEFT. Go RIGHT, DOWN, DOWN, RIGHT, RIGHT, RIGHT, RIGHT, RIGHT, RIGHT, push RIGHT, go DOWN, RIGHT, push UP, UP, UP, go RIGHT, UP, push LEFT, LEFT, LEFT, go UP, LEFT, push DOWN, go RIGHT, DOWN, push LEFT, LEFT, LEFT, LEFT, LEFT and LEFT. 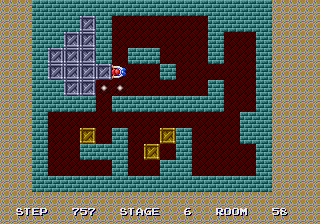 Go DOWN, DOWN, LEFT, LEFT, LEFT, DOWN, DOWN, DOWN, RIGHT, push UP, UP, go LEFT, UP, push RIGHT, RIGHT, RIGHT, RIGHT, RIGHT, RIGHT, RIGHT, RIGHT, RIGHT, RIGHT, go DOWN, RIGHT, push UP, UP, UP, go RIGHT, UP, push LEFT, LEFT, LEFT, go DOWN, LEFT, push UP, UP, go RIGHT, UP, push LEFT, LEFT, LEFT, LEFT, go UP, LEFT, push DOWN and DOWN. Go UP, RIGHT, RIGHT, RIGHT, DOWN, RIGHT, DOWN, DOWN, LEFT, LEFT, UP, LEFT and push LEFT. 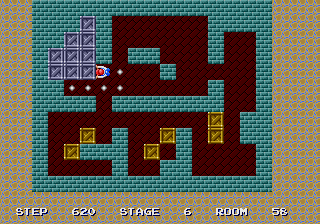 Go DOWN, LEFT, DOWN, DOWN, DOWN, push LEFT, go UP, LEFT, LEFT, DOWN, DOWN, RIGHT, push UP, go LEFT, UP, push RIGHT, RIGHT, RIGHT, RIGHT, RIGHT, RIGHT, RIGHT, RIGHT, RIGHT, RIGHT, go DOWN, RIGHT, push UP, UP, UP, go RIGHT, UP, push LEFT, LEFT, LEFT, go DOWN, LEFT, push UP, UP, go RIGHT, UP, push LEFT, LEFT, LEFT, LEFT, go UP, LEFT, push DOWN and DOWN. Go UP, RIGHT, RIGHT, RIGHT, DOWN, RIGHT, RIGHT, DOWN, RIGHT, RIGHT, DOWN, DOWN, DOWN, LEFT, LEFT, LEFT, LEFT, LEFT, DOWN, LEFT, DOWN, DOWN, RIGHT and push UP. Go RIGHT and push UP. Push LEFT, go DOWN, LEFT, push UP, go RIGHT, UP, push LEFT, LEFT, LEFT, go DOWN, LEFT, LEFT, UP, push RIGHT, go DOWN, RIGHT, push UP and UP. Go DOWN, RIGHT, RIGHT, RIGHT, push RIGHT, RIGHT, RIGHT, RIGHT, go DOWN, RIGHT, push UP, UP, UP, go RIGHT, UP, push LEFT, LEFT, LEFT, go UP, LEFT and push DOWN. Go RIGHT, DOWN, push LEFT, LEFT, LEFT and LEFT. Congratulations. 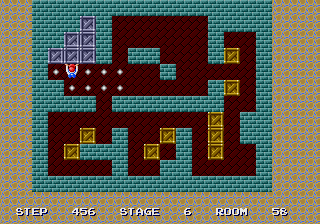 You have completed room fifty-eight. Now try room fifty-nine. 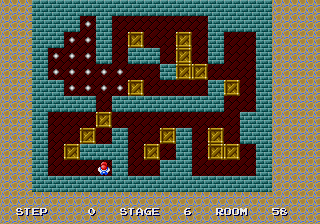 For this room, the solution for BoxWorld - World 168 works as well.